Masterpak website provides prospects and customers using smart phones easy-access to key company and product information. 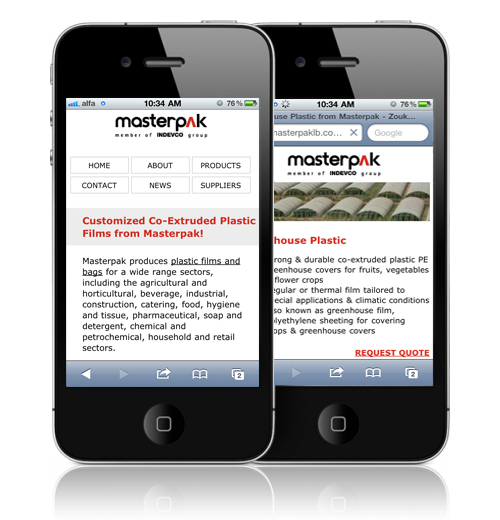 Masterpak, co-extruded polyethylene (PE) film manufacturer, integrates micro-browsing technology into the mobile-friendly website to facilitate information gathering. The website autoadapts to smaller screens on mobile devices, using web application framework and tools that offer flexibility for mobile browsing. Masterpak mobile website offers the experience as mobile web apps, providing speed and easy functionality capabilities. The site features touch events, simplifying browsing and scrolling to a finger slide. Furthermore, the website provides embedded videos, as well as optimized images with zoom and move options allowing users to better view product detail. Visitors to Masterpak’s mobile website can view products quicker through layered sliding menus and product list views. Visitors can also contact Masterpak through one tap/click. Masterpak tailored website content to the key needs of mobile website visitors. Visitors can view product details and request quotations or contact Masterpak directly from mobile devices. The website also links into the mobile-friendly version of OUTBOUND E-Newsletter, so that customers and prospects can access up-to-date news from Masterpak. The mobile-version of Masterpak website also helps visitors learn more about the manufacturer’s quality policy, vision and mission, global exports, core values, and production capabilities, as well as request to become suppliers. Masterpak, established in 1974, manufactures customized co-extruded polyethylene (PE) films and bags. The PE manufacturer produces agricultural & horticultural films, building & construction films, household plastics & catering films, food & beverage films, tissue & hygiene packaging, industrial films & packaging and soap & detergent films, serving sectors in Europe, the Arabian Gulf, Middle East, Africa, Asia, America and Australia.